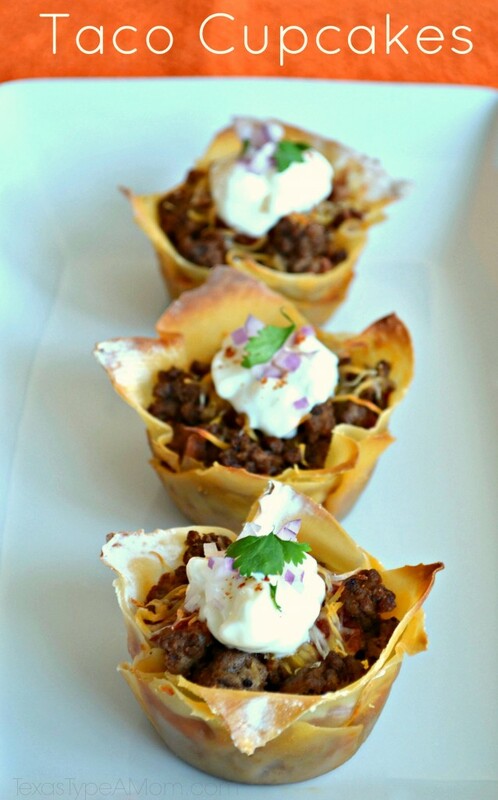 Easy Double Decker Taco Cupcakes Recipe: Tacos in Wonton Wrappers! This Double Decker Taco Cupcakes recipe makes for an easy appetizer for football season or a main dish for Taco Tuesday. All the flavors you love from tacos including the taco meat, cheese, and topping wrapped in wonton wrappers.
. She introduced me to the wonders of wonton wrappers and I haven’t looked back. We have a standing monthly get together with friends where we bring an appetizer and after bringing every appetizer in my repertoire I decided to modify a favorite main dish recipe. Not only are tacos tasty and utterly irresistible for my husband and myself, but my girls also can’t get enough either. If they had their way, we’d be dining on cupcakes multiple times a week. As I said, it’s not like my girls don’t love tacos. But serving them up something new, whether they love the flavors or not, can sometimes be a challenge. 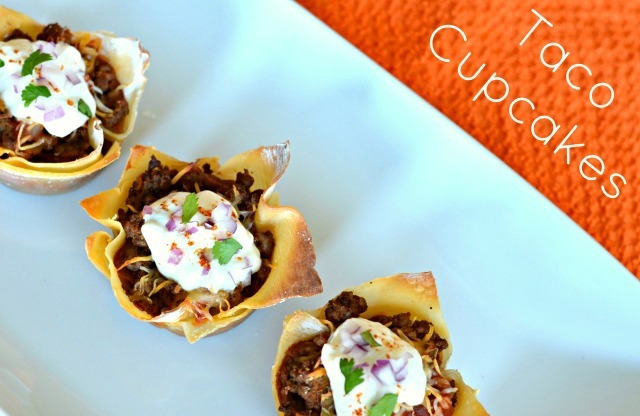 By placing it in a cupcake tin these cute taco muffins were an instant success! My first attempt at using wonton wrappers in a non-traditional (or even traditional) method ended up being such a success, I can’t wait to share my double decker cupcakes recipe! This savory, bite-sized appetizer Taco Cupcakes recipe makes the perfect appetizer for football season or a main dish for any occasion. All the flavors you love from tacos made wrapped in wonton wrappers for an easy to eat appetizer. Lightly spray 12 muffin cups with cooking spray or rub down with coconut oil. Line each muffin cup with one wonton wrapper as the base of your "cupcake". Cook ground beef until browned, add taco seasoning, and set aside. Layer 1 tbsp. of refried beans, then 1 tbsp. of taco meat, and 1 tbsp. of cheese. Place another wonton wrapper on top of cheese and repeat layer a second time. In preheated oven, bake until wonton wrappers are browned and cheese is melted about 15 minutes. After plated, top with your favorite taco toppings such as sour cream, onion, tomatoes, cilantro, salsa, and/or guacamole. 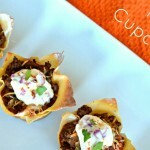 Have you made a taco cupcakes recipe or used wonton wrappers in a recipe before? We’ve been on a MAJOR Mexican food kick here, so I will definitley be trying these. I think I now have a new way to jazz up Taco Tuesday! Why didn’t I think of this before? WOW these look so yummy, and easy (always a plus!). I can’t wait to try them. These look so good! I have got to make these for my family they would adore these! I’ve used wonton wrappers for sweet treats, but never for a savory appetizer like this. Brilliant! I can’t wait to make a version of these to take to our next party. I’ll definitely have to do these one night. My kids would love them! Oh heavens these looks delicious!!! I am quite sure everyone is this house would enjoy these! What a cute and delicious looking snack. I’d like to make these on our next get together with friends. I don’t think I have used wonton wrappers. Those “cupcakes” look really cute – I just may have to go to the store and pick up a pack of wrappers and give them a try. Oh my goodness, those look delicious! I just pinned them, and they look unbelievable! I have put wonton wrappers in my shopping cart and put them back more times then I can count. All because I’ve been too scared to give them a try. But these look so tasty and almost foul proof. Those look so good! Will definitely have to give these a try. My kids love tacos and would love these! These taco cupcakes look delicious. These will be perfect for entertaining. Those look so fun! I know they would be a hit with my daughter. Wow, I never would have thought of using wonton wrappers for these. I have used them but only for making actual wontons. Not very original I’m afraid. These are cute, I like the idea. I have used wonton wrappers to make wontons, but nothing more creative than that. Wonton wrappers are fun to bake with! These are really cute — I bet my son would eat them if I made them mini and handheld for him! Tacos are a staple in our house and I bet the kids would love these. We eat tacos like every other day so this would definitely be something I’d be interested in making. That is one of the most awesome ideas I’ve seen online today! I think even my picky eater would eat those, and he eats nothing! I love this idea! Regular tacos are such a mess to eat anyway. 🙂 Aren’t wonton wrappers amazing?! I am pinning these! YUm! These look delicious! I want to try them.